What you see here is a regular case of David and Goliath with a twist - in this case, Goliath is the smaller guy. So what makes the diminutive Alto 800 Goliath? Quite simply the fact that the Alto was the best selling car last year - worldwide. The prospect of taking on such a monumental opponent should relegate most of the competition to cowering in a corner like the bullied kid at school. But that hasn't stopped Hyundai, India's second largest manufacturer from giving it a shot with the Eon late in 2011. 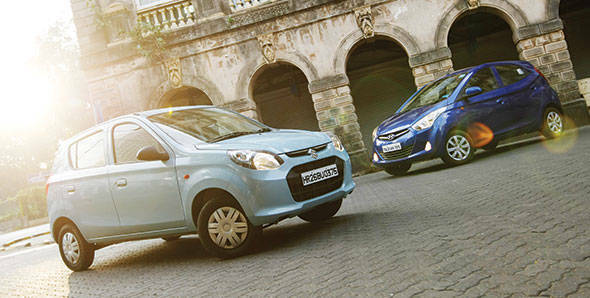 The Eon brought new levels of style and features to the segment and we liked it enough to rate it the better car. Clearly not pleased with the challenge Maruti have launched the revamped Alto 800 to remind the Koreans who's boss. It's going to be an intense battle and we're going to sit back and do what we do best. Play referee. The biggest introduction that the Eon made to the segment was style. In a segment dominated by staid decade old design the Eon introduced the flair and panache of its fluidic design philosophy that was previously only seen on the Verna which costs about three times more. The handsome exteriors feature all the curves, kinks and slashes we've grown accustomed to seeing on modern Hyundais. The interiors keep the theme going. Dual tone interiors instantly feel premium and the quality of materials used along with the fit and finish only helps the Eon's case. Simple things like the feel of the buttons and knobs along with the faux aluminum finish that surrounds the centre console simply belie the cost of the vehicle. The car is larger than the Alto and ends up being more spacious as well except for losing out slightly on rear knee room. Even the boot is as large as what you'd get on a bigger hatch. What Maruti have done with the Alto 800 is change the design almost entirely but retain the concept of the original Alto. The new headlamps along with the blackened out airdam and swollen wheel arches give the car a new found sense of presence. A strong shoulder line and Swift-inspired rear window line highlight the side profile. However, the small 12-inch wheels don't fill the wheel arches well and make the car look like its on stilts. The shoulder line runs into the new wrap around clear lens tail lamps. The interiors get quite a refresh too. There's a new dashboard layout and plenty of storage spaces all over (although there's no space for a one-litre bottle in the door pads like in the Eon). There is a new found sense of design in here after the utilitarian interiors of the old car thanks to the new instrument cluster, air vent designs and funky seat fabric pattern. Thin seats with scooped out rears help liberate a surprisingly decent amount of legroom for such a small car. The low driving position with an unsupportive seat and no height adjust for the steering wheel however isn't as good as the Eon's. Perhaps the biggest differentiating factors between the cars is that the Eon's design and interior could easily belong to a more expensive hatchback while the Alto's feel just as expensive (or cheap) as you would expect. Overall the car looks far more contemporary than its predecessors but it doesn't hold a candle to the Eon, both inside and out. The Eon was Hyundai's first petrol car in the country to feature a 3-cylinder engine. The 816cc motor produces a peak power of 56PS at 5500rpm while torque stands at 76Nm generated at 4000rpm. Three cylinder motors have one inherent down side, vibration. And the Eon has its fair share of the stuff. Vibes creep through the shift knob and the engine has a slightly buzzy note and feel. It also has a rather weak bottom end and the car can bog down when launching it from standstill if the revs aren't high enough. The flat spot low down can make you feel like the engine is dying even after releasing the clutch in first and giving it some gas. A light clutch however makes the issue easier to deal with. The five speed manual has a long throw with a bit of notchiness between cogs but it's a smooth box overall. A decent power to weight ratio of 72.43PS per tonne is affected by tall gear ratios and the car takes a good 19.08 seconds to breach 100kmph. Top speed is 131kmph. The Eon will take you 17.77km on a litre of petrol. The Alto 800 gets some extensive changes to its 796cc engine including a lighter crank, new piston rings, higher compression and a new intake system. All that has resulted in the increase of exactly one PS, for a total of 48. Torque rises from 62 to 69Nm as well. The differences when driving however are quite tangible. Refinement levels for example are much improved and quite a bit higher than the Eon (although sound deadening is about at par). A new clutch and refined gearbox help the car pull away more cleanly than the Eon from low revs although the clutch pedal feels springy and heavier than the Eon's light unit. Midrange is adequately strong with a slight flat spot in the delivery that you'll only notice when driving flat out. What you'll also notice in maximum attack is that the little Alto also has a surprisingly zingy top end where the engine seems to open up towards the last 200 odd revs before the limiter. Performance despite the power deficit to the Hyundai is marginally better and the Alto takes 18.58 seconds to the tonne and maxes out at 136.8kmph. Efficiency is almost identical as well and Alto returns a slightly lower overall efficiency of 17.72kmpl. Overall, save for the driving position, the Alto is the better car to drive but only by a little. The Eon, like most Hyundais manages to ride well over good roads but it doesn't quite handle bigger potholes as well and it crashes through broken stretches. Bigger and wider 13-inch wheels on Magna variants upwards help the Eon's stability and also give the Eon a more composed feeling under braking than the Alto. The power steering system is light and works well at low speeds in the city while feeling a bit vague and lifeless on the highway. The Alto 800 features a stiffened chassis and ride quality has been improved considerably. The car handles broken roads better than the Eon although the Eon has better high speed stability. Body roll is reduced and the car seems less twitchy at high speeds. The steering feels heavier than the Eon's but gets pretty vague at high speeds as well. Skinny tyres and lack of ABS (regrettably on both cars) means hard braking in the Alto doesn't really inspire too much confidence. At the end of the day however both cars are city commuters and are quite matched in the ride/handling category but neither qualify as driver's cars. Both cars start at Rs 2.9 lakh, ex-showroom Mumbai. The top of the line Alto LXi retails at 3.3 lakhs and for that price you get an aircon, front power windows and power steering. However you only get one outside rear view mirror and even the driver airbag is an optional extra. While it is defintely an improvement over the old car and makes good VFM it still feels built to a budget. The top Eon Sportz variant on the other hand is Rs 70 thousand more but you get considerably superior style, build quality and overall packaging with very similar levels of driving dynamics and a more complete feature list. Still if that's too much you can choose from the 16 different variants on offer with simlar levels of quality but fewer features to suit your needs. All in all the Eon feels more premium, sophisticated and like a car from a higher segment. And that's enough to let young David win. Again.